The Sphinx is a limestone mythical creature. It has a head of a man, which most Egyptologists believe that it represents pharaoh Khafre and a body of a lion. It is located on the west bank of the Nile in Giza, southeast of the pyramids. It is the oldest known monumental sculpture in ancient Egypt. It was built during the reign of Pharaoh Khafre. It measures 73 meters long and 20 meters high. According to some it took about 3 years to be built by 100 workers. It was carved into the bedrock of the plateau. There is uneven degradation apparent over the body of the Sphinx because of the limestone of the area, which offers differing resistance to erosion. The head of the Sphinx was carved out of a hard layer of stone than the rest of the body. There are a lot of legends related to the missing nose of the Sphinx. All of us must have heard of a cannonball fired by Napoleon’s soldiers that hit the nose of the Sphinx and caused it to break off. Al-Maqrizi, the Egyptian Arab historian wrote that the nose of the Sphinx was actually destroyed by a Sufi Muslim, MuhammedSa’im al-Dahr in the 15th century. He was later executed for vandalism. The origin of the word “Sphinx” is related to the ancient Greek but the Egyptians were the first to imagine such a magnificent creature. 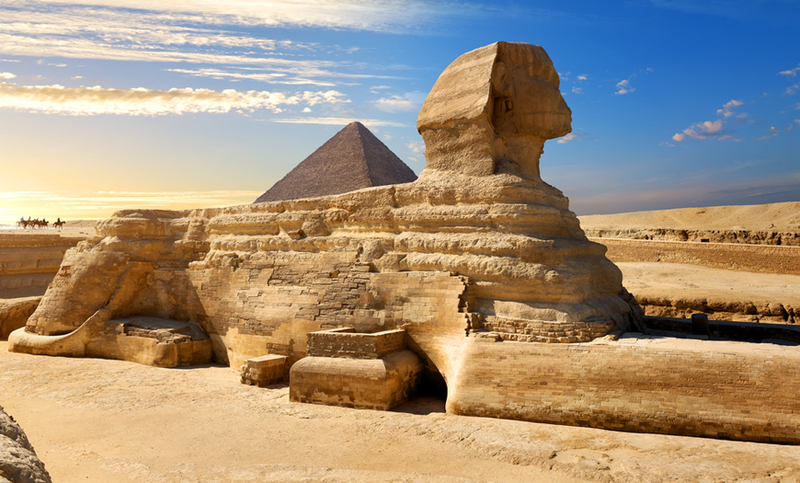 The ancient Egyptians had different names to give to the Sphinx. According to the Greek Mythology, the Sphinx is a female creature with a head and a breast of a woman, eagle’s wings, a body of a lion, and a serpent’s tail. It was sent by gods to towns of Thebes to plague them as a punishment for those who commit crimes. Sphinxes were very popular in the ancient art and they were also present in the art of the Minoan and Mycenaean cultures from the beginning of the 2nd millennium B.C. the first Sphinxes were used as votive offerings. The Giza Sphinx is a unique creature that doesn’t look like any other creatures, that you can explore during your Egypt tours packages. The ancient Egyptians didn’t identify this amazing sculpture as “the Great Sphinx“. It was referred to as “a statue of the very great Khepri”. It was also known as “Horem-Akhet”, which means “Horus of the Horizon”. Medieval Egyptians gave it names such as“balhib” and “bilhaw”. It was built during the reign of the 4th dynasty pharaoh Khafre. Some suggest that Pharaoh Khufu, Khafre’s father attributed in the construction of the Sphinx. Also Khafre’s half-brother Djedefre has contributed in the construction. The Sphinx was totally covered in vivid paint. The color of red can be seen on its head and hints of blue and yellow remain on its body. It was completely buried under the sand of the Egyptian desert until the 14th century. The 18th-century sketches indicate that the nose was missing even before the French emperor was born. The nose was missing from the 15th century by Muhammed Al- Dahr.